Enter the field with confidence when equipped with Blackhawk's gear. One of the nation's most trusted manufacturers of tactical supplies, Blackhawk continues to provide peace of mind with the M4/M16 Single Magazine Pouch. When every second counts, there is no time to fumble with gear bags or inaccessible pockets, which is why Blackhawk provides their followers with quick and ready access to additional magazine storage. A quick-clip design offers easy attachment of the magazine pouch to any S.T.R.I.K.E.® or PALS/MOLLE platform, allowing for speedy securing of gear and reorganization options. 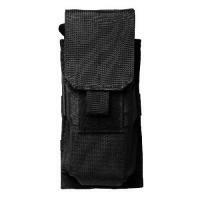 Custom-fitted for single M4 and M16 magazines, this pouch is guaranteed to hold additional ammunition through vigorous movement and activity. The 500 denier CORDURA® nylon construction ensures maximum service life. My two 30rd P-mags fit very nice inside, and just like blackhawk claimed only one mag in the pouch still has very good retention. Customer service was excellent, big shout out to all those who work behind the scenes. The only thing I would prefer would be a snap instead of the Velcro on the outside flap.